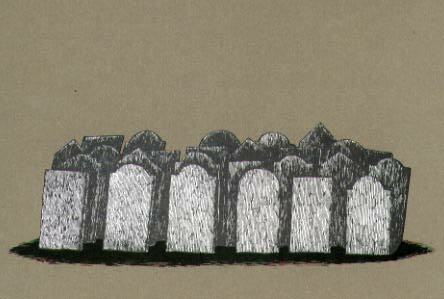 There was a lot of fuss last week about Edward Gorey’s 88th birthday, even though he died at the age of 75. There was a Google doodle and he featured in The Guardian and the Los Angeles Times and at Brain Pickings to mention just three, then Margaret McLellan sent me this catalogue of gruesome infant deaths – Hi Chris, This came today. I thought you might enjoy it. Best wishes, Maggie. F is for Fanny sucked dry by a leech. I is for Ida who drowned in a lake. O is for Olive run through with an awl. P is for Prue trampled flat in a brawl. R is for Rhoda consumed by fire. V is for Victor squashed under a train. W is for Winnie embedded in ice. X is for Xerxes devoured by mice. Y is for Yorick whose head was knocked in. What an unfortunate bunch. 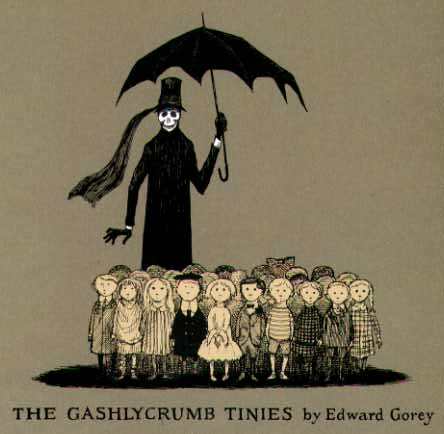 I think Edward Gorey’s macabre humour is an acquired taste. I’m not sure I’ve got it yet. I first found his work in the mid 70s on Michael Mantler’s album The Hapless Child which also featured Robert Wyatt, who turned up yesterday with Kevin Ayers. My favourite Gorey image is still Innocence, on the Bicycle of Propriety, carrying the urn of Reputation safely over the Abyss of Indiscretion, which can be found here. Also here. This entry was posted in Art, Books, Music and tagged Edward Gorey, Margaret McLellan, Michael Mantler, Robert Wyatt, The Gashleycrumb Tinies, The Hapless Child. Bookmark the permalink. Well, I’m obviously hard hearted cos I was laughing all the way through!